Club Penguin Cheats by Mimo777 Club Penguin Cheats by Mimo777: Club Penguin May and June Sneak Peek! Club Penguin is showing us the upcoming coolness for this AND next month! Sweet! What do you think each picture represents? Also, Elite Agents need to be ready to work together later this month. Herbert has something planned! What do you think Herbert will be doing? Well, the furry pic is of Herbert, The top one is the medieval party, and the bottom right one is... i think the Music Jam that MIGHT come in June? I hope its a new mission. A real mission like PSA mission>\. I think the top pic is Music Jam the bottom one is Medieval party and the middle one is Herbert! Herbert, Medivel Party And I Think Thats The Music Jam Or A New Style Of Clothes? Big Fan Of You Mimo! Your My Idle! Herbert medieval party and either piano playing is a new job or Music Jam in June? The white one is herbert. The Piano one is the Music Jam. The knight is the Medieval party! I cant wait for the new clothes for the Medieval party! Here's what I think: 1. Music Jam in June. 2. A new mission. 3. The Medieval Party. 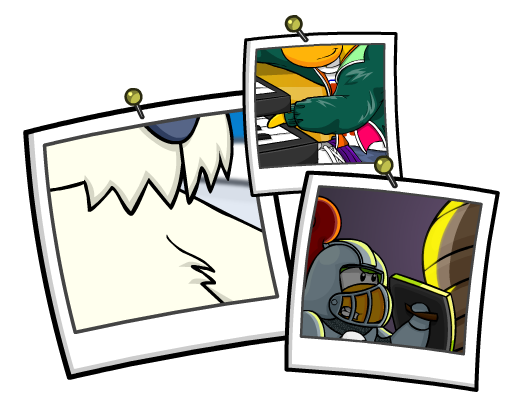 I know what the herbert one is its that he is visiting cp with a cool background.Also their is a glitch in cp mimo If you send a postcard to a mailbox thats full and you press ok when you write something in the chat bar it wont let you enter until you change rooms. Oh, thats easy. herbert, medeival party, and definetly the Music Jam!oh, and I think there finally might be an EPF mission? Easy! CP needs to make it harder! Can't wait for all three of them!! Am finally a member for another 5 months! Should have been more (Since it was my b'day money) *_* Oh well. I'm happy. '_' Bye! P.S. Poor Declan Crouch; I live around him too! (SCARED!)! The Penguin playing on the Piano means that the Music Jam 2011 is coming in June, the furry one is Herbert a.k.a the trouble making polar bear and the penguin in the knight outfit is the Medieval Party which is in May!! !